Lizzy has a fully integrated time clock and payroll module. Your employees can clock in and out and Lizzy will total the hours and drop them in our payroll area. 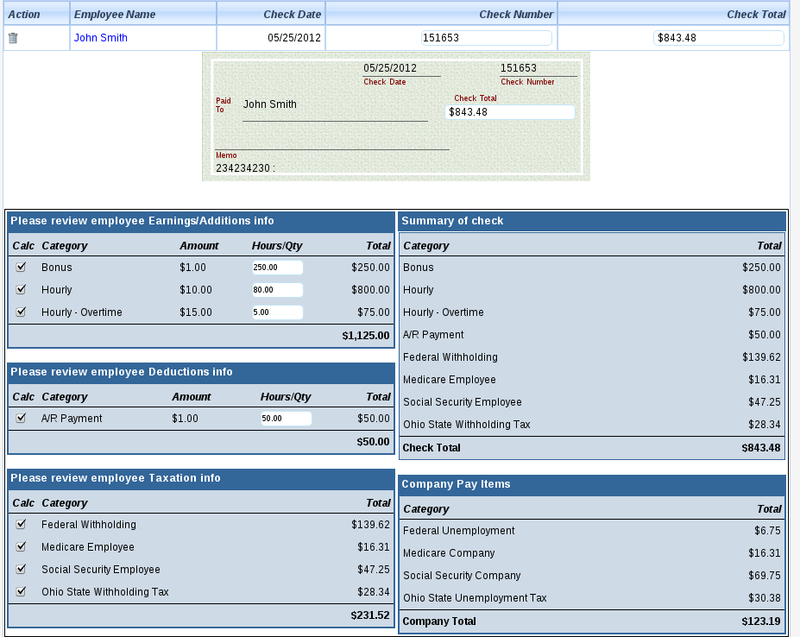 When you are ready to do payroll, just review your paychecks and generate them. Lizzy will automatically put the checks over into the checking account and you can print them out for your employees. And with Lizzy’s “quick-login” feature, employees can clock-in without having to logout and login for each employee. This makes it possible to have a single terminal serve as the time clock for the entire staff if you want. Lizzy also has direct deposit capabilities. By just selecting a few settings that your bank requires in an ACH file and entering your employees banking information, you will be able to generate an ACH bank file that you can upload to your bank for direct deposit. You will also be able to print or email pay stubs to your employees. Lizzy also comes equipped with various payroll reports, such as a Tax Liability report, which will assist you in paying taxes. She also has the 940/941 Tax reports built-in, as well as W2 and W3 reports. When running any of these reports, Lizzy pulls the information for the time period, fills in the information, and performs all the calculations for you.